Visit Bend! Cozy and Pet Friendly! 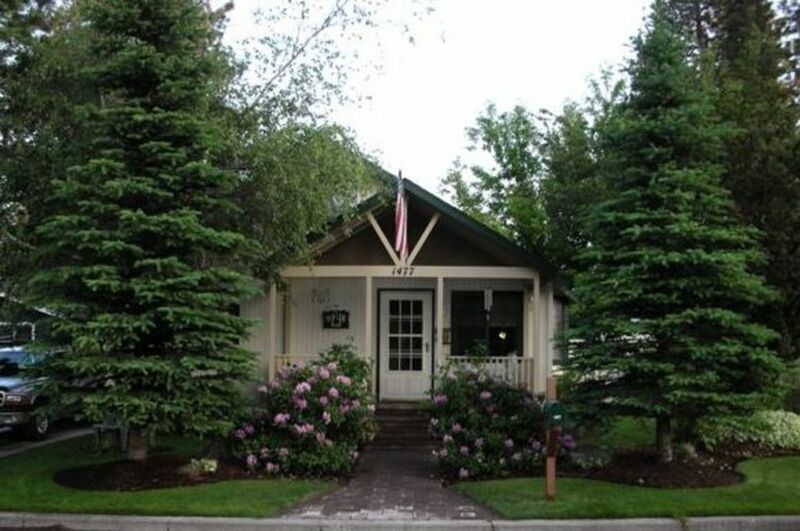 After a day of exciting adventure & sightseeing, relax in comfort with plenty of peace and quiet at our cozy cottage, located one block off Century Drive (the main road to Mt. Bachelor and the Cascade High Lakes) and right in the heart of the extremely popular west side of Bend. Our beautiful, comfortable, westside cottage offers a fully furnished, 2 bedroom, 1 bath home with deck, hot tub and a very private, secure back yard. Our rental sleeps 4 people comfortably, with a queen bed in the downstairs bedroom, and a queen bed upstairs. A full modern kitchen with stove, refrigerator, microwave and dishwasher, pots, pans, dishes and silverware. Linens and towels are supplied. Internet and cable. A DVD library, books, games. Washer and dryer, gas heat, air conditioning and all the comforts of home are provided for your convenience. You are within walking distance of numerous brew pubs, restaurants, delis, beautiful parks, downtown Bend, Starbucks, grocery stores, ski shops, video rentals, spas, ski and bike rentals. We're within minutes of the Les Schwab Amphitheater, the new water park, skating pavillion and the popular Old Mill Shopping District! The best thing about us is we're Pet Friendly! Our back yard is private, secure and fenced and is perfect for children and/or pets. There is a hot tub on the back patio. Also a gas BBQ. The back yard also has a portable fire pit. Tongs supplied for roasting marshmallows or hotdogs. Firewood and charcoal supplied. Juniper Aquatic Center - Public Pool: Juniper Aquatic Center, located approximately 3 miles from our rental offers swimming, aerobics, weight lifting, children's pool, lap swimming, etc. It is open year round. Pets: There is a doggie door for small dogs. doggie bags are supplied. Pet Dishes supplied. Spare leashes supplied. Blankets for pets to lay on supplied. All sizes of animals are permitted. $25 non refundable pet fee required. Smith Rock State Park, a popular rock climbing site is approximately a 30 minute drive from our rental (Terrebonne, Oregon), or the Three SIsters Wilderness area located in the Cascade Lakes area, is approximately a 30 minute drive from our rental. The High Desert Museum and the Deschutes Historical Society are both popular destinations for people interested in the history of Central Oregon and Bend history. Theresa and Bob Skarsten are true Bendites. Theresa was born and raised in Bend and Bob moved here from California in 1976. The westside of Bend is home to the old Shevlin-Hixon and Brooks Scanlon lumber mills. Many families lived and raised their children here. The westside of Bend is now the place to be, live and visit. Beautiful parks and walking trails nearby. Numerous pubs, restaurants, shopping and activities nearby. Bend is a dog and bike friendly town. Our home is located on the popular, westside of Bend. It has a beautiful, private back yard. It's within minutes walking distance to beautiful parks, paths along the river and activities. The home itself is very cozy and comfortable. It has a peace and comfort to it that will make you want to come back. You'll love the neighborhood and the location. toilet, shower, Toliet, Shower, Sink. Within 20 minutes walk or 5 minute drive to beautiful downtown Bend. Front loader washing machine with laundry soap in above cupboard. Front and side of house. Garage available also. Details to park in the garage will be sent with keyless lock entry instructions. Coffee, filters, tea, salt and pepper. condiments in the refrigerator. Extra food items, in cupboard, available for guests to use. Small dining table with 4 chairs. Also 4 - wooden TV trays. Note: Child's high chair supplied on request. Local BendBroadband Cable Company. Basic cable channels. Small table and chairs located next to portable fire pit and water feature. Wood supplied for portable fire pit. Patio table with 4 chairs. Please shower before using the hot tub. Private backyard with water feature (during spring/summer.) Covered patio with seating. Garage. Portable fire pit with wood supplied in large plastic bin so you can do Smores! We stayed here last June and loved it so much we rented it again while visiting my friend in Bend. It is the perfect size for us. Very pet friendly also. It is very clean, well stocked, very private backyard, a garage to park your vehicle in. The owners are the best. We will rent it again next time we visit Bend. All the comforts of home; kitchen wasn't utilized in our short visit, but would be fabulous if we'd wanted to cook. Central location to man wonderful restaurants, and Newport Market, oh my! Attention to detail everywhere...do yourself a favor, and try this oasis out! We had a wonderful stay. We appreciated the fenced yard and dog friendly atmosphere. The house is nicely furnished and the outside is lovely with many yard decorations. We also enjoyed the hot tub—that was a plus after skiing all day. We would definitely stay again. This home was clean and very well stocked. The hot tub is well situated, even on those rare days when it rains in Bend! It's in a good location for getting around in Bend and the owners were helpful and very easy to work with. Great stay in Bend. Location can't be beat, plenty of parking, wonderful secure back yard for pets. Comfortable house with good wifi and television. Loved the hot tub and fire pit. would stay again any time. very nice, clean, and stocked well in Kitchen, Bathroom, and bedrooms. We enjoyed our time at the Skarsten house, and hot tub. We had lots of birds hanging out, a squirrel, we enjoyed the hot tub, and the fire pit. I like the fact that the garage was available for parking, When we come back I would definetly see if this would be available again! Our rental is located one block off the main highway to the Cascade High Lakes and resorts and Mt. Bachelor Ski Resort (our rental is 5 blocks from the Mt. Bachelor Ski Resort Shuttle). The Redmond Airport (RDM) is approximately 15 miles from the rental. PDX - Portland International Airport is approximately 3.5 hours driving distance. Smith Rock State Park is approximately a 30 minute drive (Terrebonne, Oregon.) Our rental is also approximately 20 miles from Sisters, Oregon, which hosts a popular quilt show every year. Other Activities: Kayaking, Canoeing, Floating the River, Museums, Les Schwab Amphitheater events. We're only a few minutes from the new Colorado Street water park and the new, ice skating pavilion that opens in November 2015. Golf: Central Oregon has some of the best golf courses in the state. We are located 7 miles from Widgi Creek, a popular area golf course and we're located minutes away from the River's Edge Golf Course. Ski: Mt. Bachelor Ski resort is a 30 minute drive from our westside rental. We are located 5 blocks from the Mt. Bachelor Ski Shuttle pick up/drop off.